Couture has a pricepoint that is only attainable for those living a jet-set lifestyle. So maybe Karl Lagerfeld was cheekily alluding to that fact today by showing his latest Couture collection on a elaborate set designed to look like the inside of a private jet. In front of a star-studded crowd that included the likes of Cameron Diaz, Diane Kruger and Vanessa Paradis, Lagerfeld showed a chic collection in a myriad of blue tones. Drop-waisted shapes dominated the range as did pockets- Karl even added pockets to luxurious couture dresses in an unexpected yet delightful twist. Another trend that emerged from the show was heavy embellishment- sequins and beads adorned gowns and twinkled on tights (which girl wouldn't love a pair of Chanel embellished tights?). Another key styling detail was oversized collars, very 1950s and Jackie O in style. 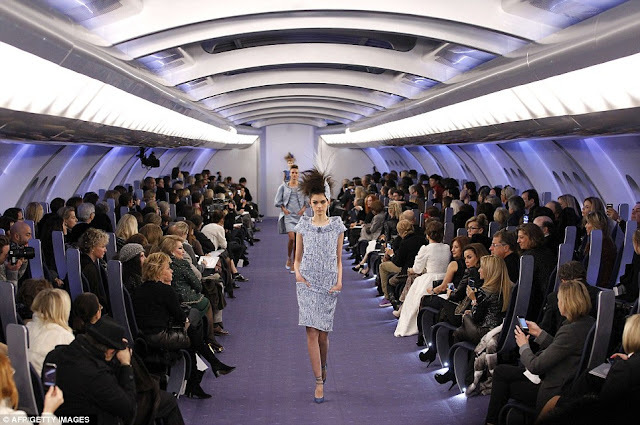 There's no denying the show was a sartorial success, all aboard Chanel Airlines, this collection has wings! I know- all I want is a pair of embellished tights and I'd be happy! But I'd probably go bankrupt buying those alone! Nice review of the collection - I love all the embellishments! I love the setting of the catwalk!! Very original. I went to the Chanel shop this weekend in Bond Street and wanted to practically die because I couldn't afford anything. Life is just too cruel sometimes!! Mmmmm ... Chanel. Chanel = Heaven. I love everything. I really loved the silhouettes in this collection!